WHETHER you’re a local or a tourist looking to have a good time at Sentosa, accommodations are aplenty but are difficult to choose from, be it due to the price considerations, availability or proximity to surrounding attractions. Good news, The Outpost Hotel is coming to Singapore’s island getaway – the State of Fun – and it looks set to impress. Singapore’s largest hotel operator Far East Hospitality (FEH) is putting the finishing touches on its first foray into the existing, already competitive list of accommodations located on Sentosa, home to over 3 kilometres of man-made beaches surrounding the coast, with The Outpost Hotel just one of the three developments they are rolling out in 2019. What’s more, The Outpost Hotel is now a member of Small Luxury Hotels of the World (SLH) — an elite organisation with a portfolio of over 500 independently-spirited hotels in more than 80 countries around the world. Guests who book their stay through SLH directly will be able to join their loyalty program, Invited, which rewards members with exclusive privileges. Will The Outpost Hotel give the incumbent establishments a run for their money? Here’s why we think this may be the case. If you’re a millennial or even better, a young couple looking to spend a cosy, intimate time far from all the hustle and bustle, well, FEH has sculpted the place just for you. With 193 guest rooms, it’s built on elevated ground on the streets of Artillery Avenue. The Outpost Hotel is a tailored experience for adults looking for a romantic getaway – children below 12 years old are not allowed. It’s right next to Imbiah Station, which is a convenient gateway to the main attractions on the island, such as the casino or many of the party-heavy beaches where the fun is. The hotel is also within walking distance to both Universal Studios and Serapong Golf Course. Essentially, The Outpost Hotel is going to be nestled right in the heart of the island. Imagine being not too far away from all the action on the island – it sounds pretty damn fantastic. The interior design of the hotel is based on timeless tones of black and white. Bold and clean-cut lines, accentuated with wood and earthen hues, impart a sense of zen. The well-placed windows look out to the South China Sea. These are just the teaser images, but if the warm lighting fixtures in the rooms really look this good, then the mood for a romantic escape for two is set. Deluxe room with sea view. Not to forget, a couple’s getaway isn’t complete with a dip in the pool and sharing a drink over the breathtaking view of the sunset. Picture yourself with that special someone in that alluring infinity pool. If sparks fly during your time here, you may one day return to bring your relationship to the next level; the hotel’s fully-equipped Revelry Hall is the new it destination to hold engagement parties. Guests who stay during the opening festivities (running till June 2019) will also have the option to have breakfast at Ola Beach Club while overlooking a serene, undisturbed beach bereft of the afternoon and evening crowds. You may be thinking: fancy pool decks and classy decor in hotel rooms are a dime a dozen. Ultimately, its the location that makes The Outpost Hotel the promising candidate here. 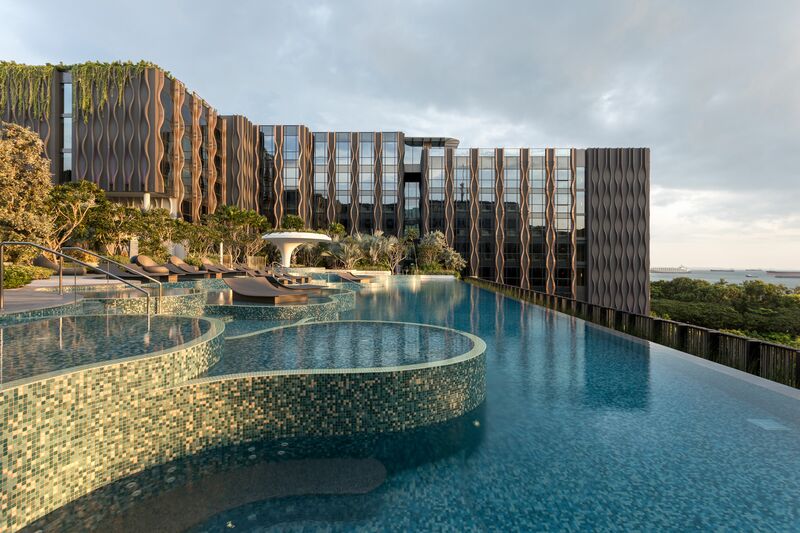 Having elevated ground for the hotel to stand on will provide guests an excellent vantage point for couples who want a slice of everything Sentosa has to offer – an experience like no other. If you’re leaving the car at home, certain coaches that shuttle tourists to the island will make a stop right beneath the development, making the journey from hotel to the main island that much more convenient. The Outpost Hotel is set for a soft opening from April 2019. It all looks promising so far – stay tuned for our in-depth review once it opens to see whether it lives up to the hype.